On Tuesday January 10th FAMU Recruiters made a special trip to Jacksonville to visit with students that attends Catapult Academy. Catapult partners with School Districts to operate their Drop Out & Credit Recovery Programs. Catapult recruits students between the age of 15 to 20 to return to school and receive their diplomas. Students with the highest GPA’s were presented at the FAMU Recruitment held at Catapult Academy. 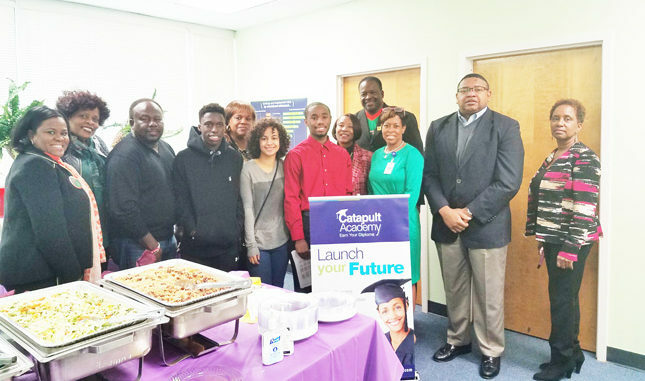 Catapult operates seven schools in Jacksonville located throughout the community with a total enrolment of approximately 1500 students. Many of these students return to earn their diplomas and continue their higher education after graduation. FAMU is one of several HBCU’s that partners with Catapult to recruit their students. Last year Catapult had two students that enrolled in FAMU’s school of Engineering. Mrs. Charmaine Blue, Regional Manager of College Career & Community Relations, says Catapult has other similar events planned throughout the year. Seabon Dixon III, Director Of Business & Community Partners, and a past State President of FAMU National Alumni Association, invited several persons from the University and District to bring greetings. Pictured are attendees Dr. Kevin Lawson, Chairman of FAMU’s Board of Trustees, Dr. Pam Davis Director of Alternative Education with Duval County Schools and Mrs. Betty Burney, Past School Board Chair, and Ms. Angela Freeman, President of the local Alumni Chapter, all greeted the students and shared their individual stories related to FAMU and Catapult students pictured are: Teddy Liguyani, Jasmine Tews and Bradley JoaZil-Wallace, Dr. Pam Davis, Carolyn Tews, Constance Hall, Seabon Dixon III, Kevin Lawson and Charmaine Blu.